What Material To Use For The Lab? I am getting a lot of emails inquiring about what material I used to pass the lab. From May on I worked on INE’s vol 2 and 3 along with mixing in my 360 material I did earlier. If I needed some tech focused material I used my Narbik’s workbook along with INE’s ATC. One thing I can’t do is endorse one vendor over the other. I think each vendor has their own pros and cons. One thing I will say not to do, at least in the beginning, is use multiple vendor material. Do your homework, get the best deal you can and pick one vendor. After that, go through all their material step by step. If they have a guide on how best to use their material, try to follow it as best you can. I had multiple material from the start and it did nothing but slow me down and challenged my attention when it came down to doing full labs. I was always jumping around from one vendor material to another vendor material. This did absolutely nothing for me. So pick a vendor and go through all their material end to end. After that maybe mix in some other material to see how another vendor presents it. The second piece of advice I would give is to lab as much and for as long as you can. I always worried about the theory which isn’t a bad thing, but don’t take away from your lab time for it. If you hit a technology you are weak on, lab it a couple of times then go through any videos/documentation on it. My studies didn’t gain any momentum until I started sitting the 360 online mentoring sessions by Bruce Caslow this past February. In the first one I was in, he talked about how time on the CLI will make you understand everything so much better. 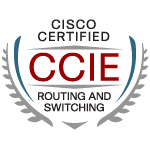 When I went through the Cisco 360 labs, I found that it did. Sitting down and doing at least one lab every week made a huge difference.